Happy birthday Julep! I can't believe Julep has been established for two years now. I'm so glad I've been able to be along for so much of the ride. This months box is The Garden Party themed. I switched to the It Girl style since I wasn't very interested in the Double Step Food Treatment and Friction Stick. 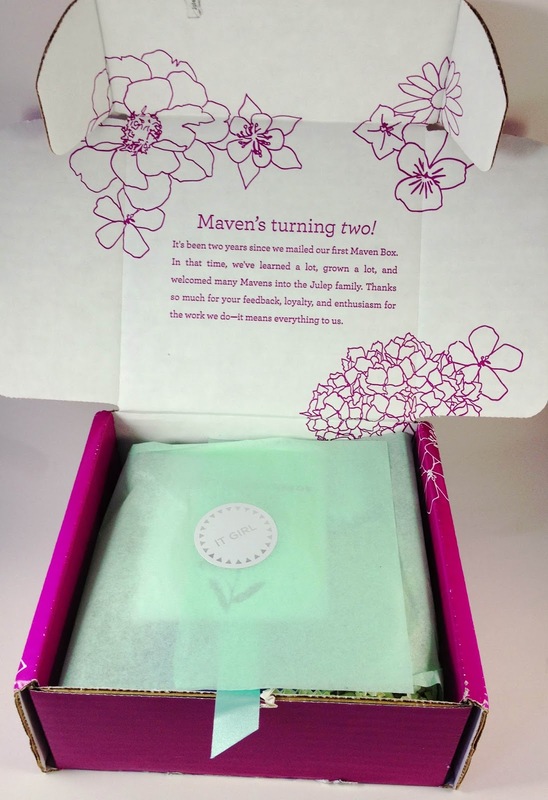 Maven's two year anniversary message is inside the box with a pretty little floral pattern inside. Inside there is a pastel color theme with this months card, my three polishes all packaged up nice and pretty and this months extra, forget me not seeds! Julep, how did you know that my favorite flowers on earth are forget me nots!? My colors this month are Nellie, Marjorie and Fiore....I think Julep may be running out of female names to give their polishes. Nellie is a pink fuchsia creme. The coverage and color pay off was spot on! This is the standard Julep that I've come to expect! Two coats for this deep color and coverage. Fiore is an espresso brown creme. I actually found it had some subtle deep purple tones in it as well....tell me if you think I'm crazy. The formula was Juleps top notch stuff! Only two coats for perfection. Marjorie is a citrus orange frost. The orange hue to the polish is already gorgeous, add into it the golden shimmer and this color is straight out of the park. I loved my August box and I'm so glad that Julep is celebrating with us this month. I can't wait to plant my forget me nots! Thank you Julep! 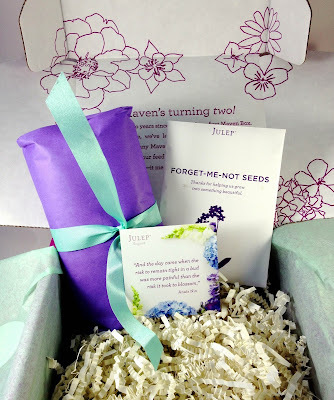 Want a free Julep box of your own? Just click here and take the Julep style quiz. 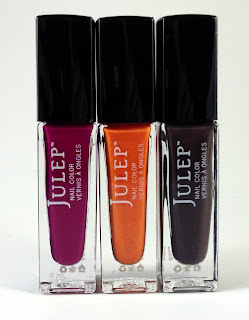 They will send you a box of Julep polish for free when you use the code FREEBOX at checkout! Keep in mind that Julep sells for $14 a bottle at Sephora so you will be getting a great deal. After that Julep will continue to send you boxes each month for $19.99 or you can just cancel your subscription and keep your free box with no penalty. Who doesn't love free stuff?